Mediaployment - Stowarzyszenie Młodzieżowych Inicjatyw Twórczych "CREATOR"
SMIT "CREATOR" is happy to announce that our TC Mediaployment was approved! The Training will be held in Rabka-Zdrój, Poland from 23 to 30 October 2013, and will bring together 24 young leaders, organization leaders and volunteers. Training course called MediaPloyment brings together to Rabka-Zdrój, Poland between 23rd to 30th of October 2013, 24experienced youth leaders, trainers, youth workers, project managers from Armenia, Belarus, Azerbaijan, Georgia, Italy,Moldavia, Poland, Spain, Ukraine, United Kingdom, Portugal and Turkey . The main aim is to raise visibility and awareness ofYouth in Action program opportunities for co-operation between EU and EECA countries in order to enhanced understandinghow social media could be useful tool for youth in finding employment and increase awareness of danger which comes withit. Social media refers to websites, technology, applications or tools that allow online sharing of information, and encourageinteraction between individuals via the internet. Some of these tools focus on building online communities or networks, and theycan also be used to facilitate finding job vacancies, getting advice and guidance to help in the job search. By using non-formaleducationmethods and organizing a meeting with a specialist we will try to emphasize to our participants how to take advantageof websites they use every day not only in order to have fun but also advance their careers, bearing in mind the indication of thehazards awaiting them such as cyber- bullying. Participants will be also involved in different activities through the methodologyof non formal education such as simulations, role-playing, open space discussions, brainstorming, ice-breakers and reflectiongroups. The acquisition of such competences will be useful for young people to apply it in their life and work, especially ina period in which unemployment has reached incredibly high numbers in Europe . The result of this Training Course will becreating manual about the themes above mentioned which will be useful tool for anyone searching for the tips how effectivelyfind a job using social media. 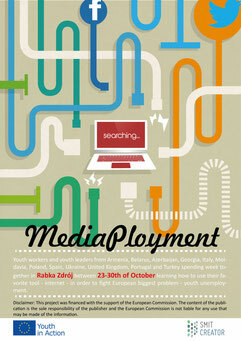 Training course „Mediaployment” which took place from 23rd to 30th of October In Rabka- Zdrój was a very successful one. SMIT „CREATOR” took care that each participant could have spent those 7 days in the atmosphere distinctive for „Youth in Action” programme which means: hard working, satisfaction with implementing entrusted tasks, working on manual- and all of those activities were fulfilled with fantastic integration with youngsters not only from Europe. A topic that the project refered to is close and well-known to everybody and especially nowadays it is so important to realize how to use those tools efficiently but first of all, wisely on job market. Each of workshops opened our eyes and helped us to look wider on the apect of work and social media, like linkedin and facebook. Many of us did not realise the influence of media that we use daily for the social purposes, for our job or for the process of searching it. Each participant took part in several discussions, was engaded in group work because, firstly – the integration went really, really fast, everybody became friends to each others and that is why nobody wanted to disappoint anyone. Secondly, every young person has some experience and knowleadge about the topic we worked on. There were not any random people participated in the project then. They were all neatly chosen and working laboriously to create such a thing that would be useful for their successors -trainers, activist, liders interested in this field. Our creativity and engagement became the most visible during formation of the manual. Postcards, a board game, a newspaper, a guide-all of them but not only was created in a very few time. We are satisfied with all the results and a lot of us are willing to cooperate in the future on following projects. From 23 to 30 October 2013 I have been one of the 24 participants of the training course Mediaployment organized by „SMIT Creator”, Poland. The main aim of these training was to acquainted participants with the possibilities which social media offers during job searching. Thanks to all activities I have learned what are the opportunities and threats of being regular user of social media tools. What’s more I got to know how to secure my privacy in Internet. Meeting with social media specialist has broaden my knowledge about methods and tools which we could use to increased our chances for being employed. During activities I have had a possibility to cooperate with participants who are: film-makers, graphic designers or journalists by profession. Thereby, I have gone through faster course of using graphic and film editor programs. On our public forum we have a chance to discuss reasons of the unemployment in countries which was represented by participants. Besides activities strongly connected with the main topic I have gone through brief course of self-defence, carried out by youths from Great Britain. I have learned cultural differences needed to know while working on international level. Additionally, I got to know how to create board games in practice. The whole training was varied by intercultural evenings, movie nights, karaoke and campfire. Thanks for my organization(„SMIT Creator”) for the possibility of being the part of this event. Admiring the persistence you put into your web page and information you offer!